Welcome to the series More with Less where we look at various ways we can live a more abundant life with fewer possessions. I hope this series helps you to rethink how you view your money and possessions. You can read the intro My Journey with Money and previous installments: The Four Purposes of Money, Give Your Money Away, Cultivate Contentment, Own Less Stuff, and Fear, Faith and Money. Today we make the Ryan’s final master’s degree tuition payment. It’s a day we’ve been working hard towards for over two years and, oh man, am I ready for it! Before Ryan was accepted to his program we decided we would not take out loans to pay for his education. We knew it would mean big sacrifices, from making major cuts to our grocery budget (and spending in general) to moving back to Oregon. We knew it would be hard but going debt-free was best for our family1. In the time since we made that decision we have seen God work in amazing ways. I have learned so much about spending money wisely (and I’m definitely still learning! ), using our resources well and most importantly we’ve seen God’s faithfulness in incredible ways. It’s been hard to never know for sure where the money for the next payment was going to come from but the money was always there. Through one means or another God provided the funds we needed when we needed them. I didn’t have to worry about it, though I did at first, and I slowly recognized that Ryan and I do not hold the responsibility of providing for our family. We are responsible for working hard and being wise with what we have but ultimately it’s not up to us to provide all our family’s needs2. That’s God’s job. 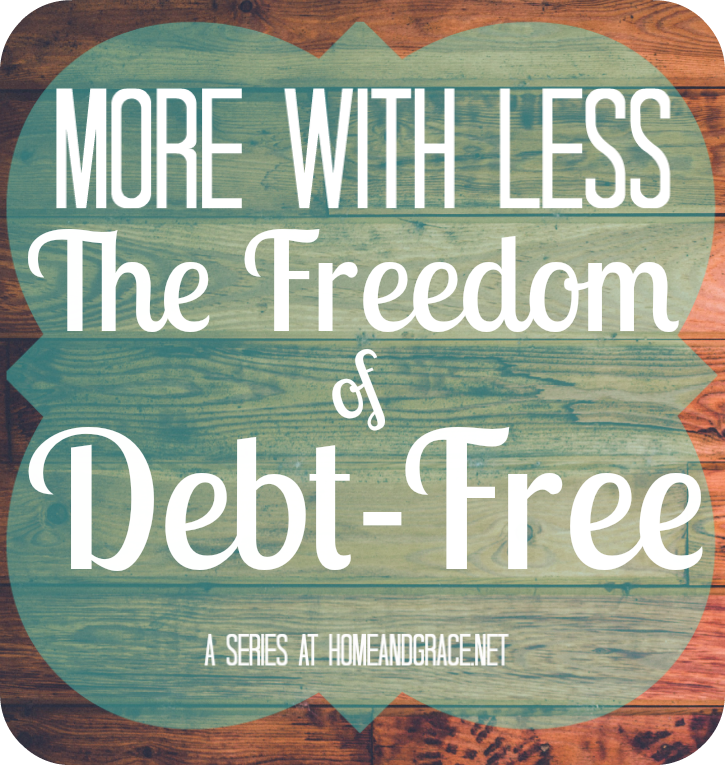 By making the radical choice to not go into debt we have experienced the freedom that comes along with it. We don’t owe any money to anyone and we are free to move forward without the burden of monthly loan payments. We can pursue what God is calling us to without the past holding us back. After having my own student loan for over six years, we know what it’s like to have the weight of debt and it’s not something we are likely to take on again (except perhaps in the form of a mortgage). As we make that final payment, we will remember how God has provided for us and give thanks for all the ways he brought in money to pay for tuition. We will marvel at a God who loves us enough to enable us to live in financial freedom. Will you allow God to do the same for you? 1 While I do believe that everyone can benefit from debt-free living, I would never presume to say that everyone should be debt-free. It’s what we’ve judged to be best for our family and our situation. 2 I say this in full recognition that for the next six months (and in some ways the last two years) we are living off the generosity of others. It’s been a growing experience for us, and some other people as well, and while we are thankful for this experience, the reason Ryan’s getting his MA is so he can get a full-time, permanent job, God willing! Categories: More with Less | Tags: Debt-Free, Money | Permalink. A hearty congratulations on making it through such a trying financial season without debt! I am constantly impressed by your commitment to financial responsibility. I also really appreciate that you’ve specified that debt-free may not be (ever, or in various seasons) a good decision for everyone. Such grace in your words, as always.